Kerstin Brätsch, Unstable Talismanic Rendering [Poliʻahu’s Cure], 2016, ink and solvents on paper, neon tubing, dimensions variable. This exhibition winds through the gallery along an unmarked path, yet visitors intuitively pick up on an intended route, as if by a sort of tropism. Indeed, the rhythms and rituals of nature are the premise for Kerstin Brätsch’s current exhibition, which draws inspiration from Full-Fall, a sequence of art rituals that take place in rural settings in conjunction with the solstices. Full-Fall was conceived and organized by the artist Davide Stucchi and the theoretician Mattia Ruffolo, who together invited Brätsch to contribute a work based on the notion that an animist energy underlies all matter. This exhibition is the spontaneous evolution of a continuing dialogue among Stucchi, Ruffolo, and Brätsch. The gallery’s spaces have been stripped bare and repopulated with object-signs charged with just such an animist essence. 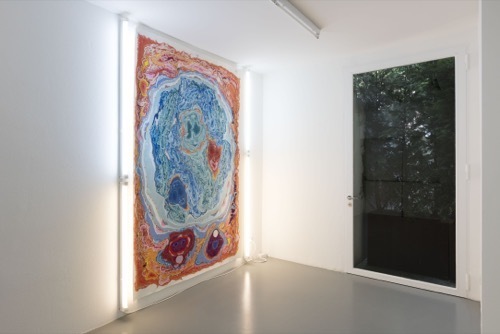 In works like Unstable Talismanic Rendering [Poliʻahu’s Cure], 2016, large surfaces have been created using a marbling technique on paper, and a series of self-supporting structures, partially illuminated by neon, incorporate antique glass made in Switzerland by the same master glassmaker who long collaborated with Sigmar Polke. The entire show, it turns out, represents a ritual to bring about a reconciliation between the Hawaiian deities Poli‘ahu and Pele, wherein various spherical sculptures, each created from a different stone, are meant to allay their mythical rivalry and bring about rapprochement.